I’ve not spent a lot of time watching films of musicals in the past and wasn’t a regular theatregoer until well into my 40’s, which means there’s a lot of really well-known musicals that have completely passed me by. 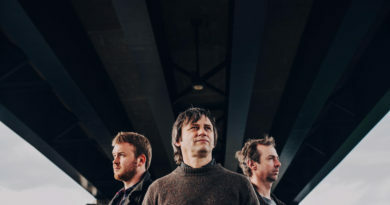 Generally I enjoy the experience of watching them with fresh eyes, knowing only the basic outline of what I’m about to see and finding out that songs I love have come from a particular place. There is always a bit of anxiety though about what I might be about to find out – for example, although My Fair Lady has some absolutely banging numbers and great dancing, I was shocked by how awfully, terribly misogynistic it was and how we found ourselves laughing and clapping at a song that was a textbook example of abuse and coercion. So I went into Annie at the Bristol Hippodrome a little apprehensive, knowing that it’s a story about an orphan girl whose main characteristic seemed to be being ‘sweet’. I’ve got to admit that I found the first few moments – a girl about my daughter’s age waking up and screaming for her mummy only to be shouted at by another load of young girls – upsetting. It was all OK though. Abuse isn’t painted as anything but abuse in this musical; even as we laugh at it we recognise the monsters for what they are. The final messages are about not leaving your friends behind, about looking after others and sharing the wealth, about optimism and keeping going through the bad times, and about Franklin Roosevelt’s ‘New Deal’ which bought new hope to depression-era America. So the monsters… Well, Anita Dobson is a superbly awful Miss Hannigan, all gawky limbs and angles and casual cruelty. The contrast to Annie is wonderful – where Annie takes the bad times and looks for the good Miss Hannigan is only able to see the downsides and spreads the bad feelings around freely. This was a perfect performance, where at times we were almost – but never quite – made to feel sorry for her as she belted out self-pitying songs about how much she hates little ‘goils’. The big star though was tonights Annie, Freya Yates. 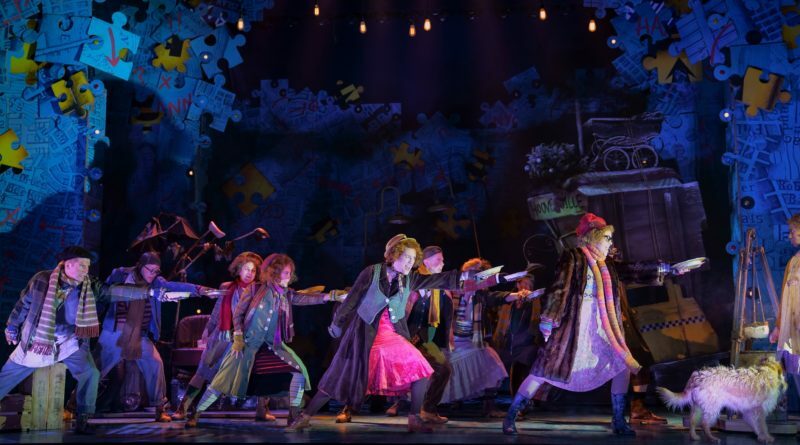 It seems that there are three Annie’s and three groups of young performers playing the orphans, and I find it hard to believe that the producers managed to find so many awesome young people to play these roles. Annie sings and dances and never puts a step or a note or a move wrong, she was lovable (even the old grouchy Goth that was my companion last night might have cried a little bit at times) and wonderful and I am sure that as she grows we will see her again. That also applies to all of Team Rockefeller who were the orphans last night – they were perfect, and there was no compromise on the standards because of their youth. Their performances were spot-on. I won’t name check all of the cast, but this was true across the board – they were awesome. I also loved the set design which at times was largely a collage of jigsaw pieces; the point at which some were flame-lit against the sea green background was stunningly beautiful. So all in all this was a lovely experience: a feel-good musical beautifully designed, produced and performed which made me feel a bit teary at times but overall uplifted. What more could you ask for from a night at the theatre? 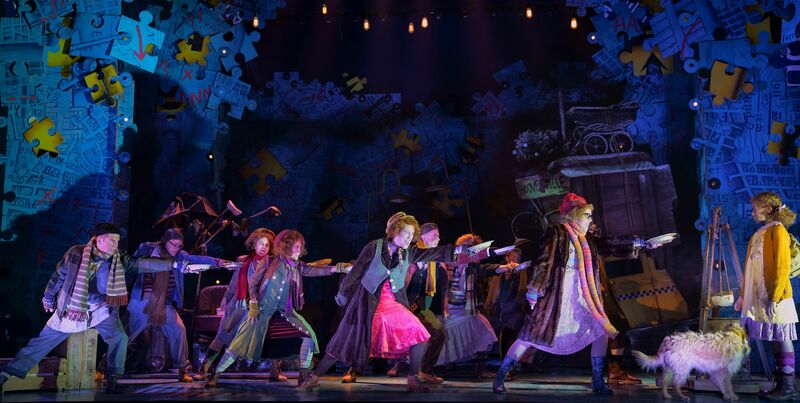 Annie is on at The Bristol Hippodrome until Saturday 23rd March.